The Hubble Space Telescope's main eye on the universe should be back up and running soon. Hubble's Wide Field Camera 3 (WFC3) took itself offline last week as a safety precaution, after onboard software noticed anomalous voltage readings within the instrument. 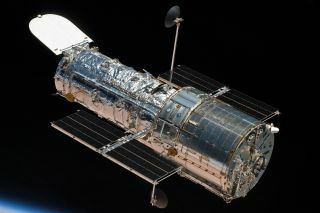 But Hubble team members have now determined that voltage levels actually remained within the normal range, ascribing the glitch to a telemetry issue rather than a power-supply problem. The mission team reset the relevant telemetry circuits, gathered some more engineering data and then brought the WFC3 back to an operational state. "All values were normal. Additional calibration and tests will be run over the next 48 to 72 hours to ensure that the instrument is operating properly," NASA officials wrote in a Hubble update Tuesday (Jan. 15). "Further investigation using both the new and the previously collected engineering data will be conducted to determine why those data values were originally incorrect," the officials added. "Assuming that all tests work as planned, it is expected that the Wide Field Camera 3 will start to collect science images again by the end of the week." The WFC3, which was installed by spacewalking astronauts in 2009, views the universe in visible-wavelength light and has snapped some of Hubble's most famous and spectacular photos. Hubble also features three other cameras: the Advanced Camera for Surveys, the Space Telescope Imaging Spectrograph and the Cosmic Origins Spectrograph. All of these instruments continued to function during WCF3's downtime. Hubble launched to Earth orbit in 1990 as a joint mission of NASA and the European Space Agency. The telescope has recently shown some signs of its advanced age. For example, a problem with Hubble's orientation-maintaining gyroscope knocked the telescope offline for much of October.